It's been so crazy to have t-shirt weather in February. Supposed to start cooling off today to more normal weather. My image for today goes back to a late summer day at the railroad I help at outside Topeka, Kansas. These are the two 12 inch scale locomotives that we run most. They were just cleaned and moved out of the way to work on some other things so I decided to take a photo of them. 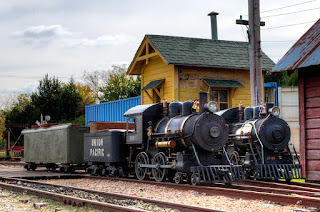 They are sitting beside a couple of actual railroad buildings that were moved in to make the area look more authentically railroad.